As I’ve been involved with bodily health and the health of the skin, I recognize the importance of daily nutrients, vitamins and minerals. The best way to achieve this intake of necessary food for the body and skin, it’s best to consume a smoothie 5-7 times a week. The skin is the largest organ on the human body. The rotation of ingredients is excellent to prevent allergies and common skin irritations. Any kind of skin irregularities is a sign of an imbalance within. The skin is a mirror to the internal factor and the eyes are the mirror to the soul, as they say. Try looking at foods that are high on the alkaline table and eat less foods on the acidic table. Try not to mix any vegetables with fruit in your smoothies. Add flax seed or flax oil, 1 tablespoon in your smoothie daily. Try mixing any of a combination of these ingredients for a delicious and healthy smoothie. Pick a food for thickness, one for blending and many more toward your healthy skin goals. Remember to drink your weight in water, get enough sleep and please do not forget your SPF. 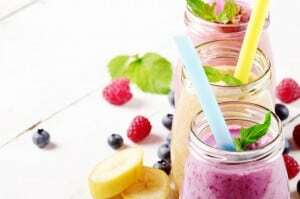 Place ingredients in blender and blend on high until smoothie has a nice smooth texture. Add coconut water or almond milk to reduce thickness. COCONUT WATER: Very hydrating for skin and body. Filtered water with coconut oil can be a replacement. ALMOND MILK: Fills in for a dairy fix. Very beneficial for a healthy heart, keeps bones strong and gives strong muscle strength. BANANAS: Rich in potassium, helps keep bowels healthy which is so important to overall health of body and skin. FLAX SEED OR OIL: Helps to rid your body of chemicals, viruses and other unhealthy toxins. High in omega 3 fatty acid for improved cardiovascular, immunity, brain, joint and digestive performance. OLIVE OIL: Reduces inflammation which is a major cause of skin irregularities ie; acne, redness and rash on skin. High in antioxidants! MANGOS: Full of carotenoids, which help put a glow into your skin. If your skin looks dull, you will see a difference. PINEAPPLE: High in vitamin C, a key to the production of collagen, giving skin firmness and strength. BLUEBERRIES OR STRAWBERRIES: High in antioxidants which help lower blood pressure and make blood vessels more elastic. As the old saying goes, “We are what we put into our bodies.” If we want to be energized, hydrated, glowing skin and hair, focused, healthy from the inside out, it’s important to put the right kind of fuel into our bodies. Think of a car, and how it needs an oil change every 3,000-3,500 miles. You service your vehicle so it’s system runs efficiently all the time. When it comes to our bodies and our organs, it’s the same exact concept. Provide yourself with the fuel it needs to have the healthiest system possible.